What is Shop Floor Data Collection Software? You rely on information to manage your business; and better information allows you to make better decisions. If you are like most manufacturers, important shop floor efficiency and machine downtime data is collected manually and entered into the production tracking system by a human operator. It is very likely that this manufacturing data is not as reliable as it could be. The three common problems with manual collection of shop floor data are untimeliness, inaccuracy, and bias. Considering that this raw machine data forms the basis for all subsequent production reports - and that important management decisions are made based on those reports - any problems with the initial shop floor data collection can start a ripple effect that results in a negative impact on your business. ShopFloorConnect Asset Utilization Software and hardware automatically collect shop floor production data that is timely, accurate, and unbiased. Best of all, this production tracking system does it automatically, and in real time! 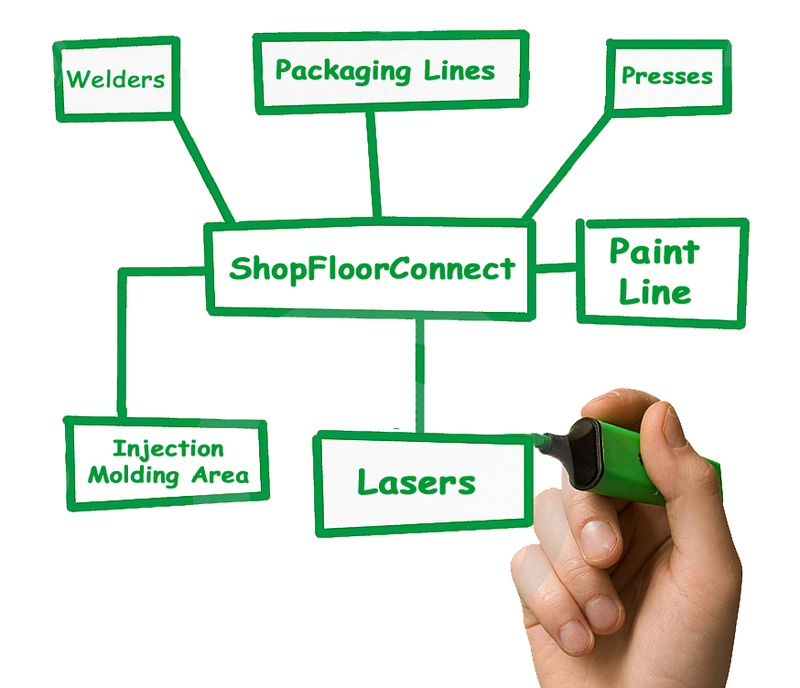 ShopFloorConnect is a state-of-the-art shop floor management system that is scalable and flexible. ShopFloorConnect production tracking software comes factory-configured to talk to the ShopFloorConnect Machine Interface over your existing Ethernet. ShopFloorConnect tracks machine uptime, downtime, the reasons for downtime, production rate, and piece part counts (when applicable). Running ShopFloorConnect for your shop floor data collection is like having a team of manufacturing engineers doing a detailed efficiency study of the entire factory - all the time. Learn how ShopFloorConnect calculates OEE and tracks OEE. Many currently available shop floor data collection systems require you to install special software on all computers that need to access the shop floor production data. This is not the case with ShopFloorConnect. If your computer has a web browser and email client, you have all you need to take full advantage of ShopFloorConnect's production tracking capabilities - even from remote locations (provided you have remote access to your network). The scheduling interface feature in ShopFloorConnect production tracking software allows you to create a queue of jobs to run in each machine. You can either import a schedule from your existing ERP software, or use ShopFloorConnect's web browser interface to select the appropriate jobs and the quantity of parts required. You may optionally enter a job number and/or due date for each job. 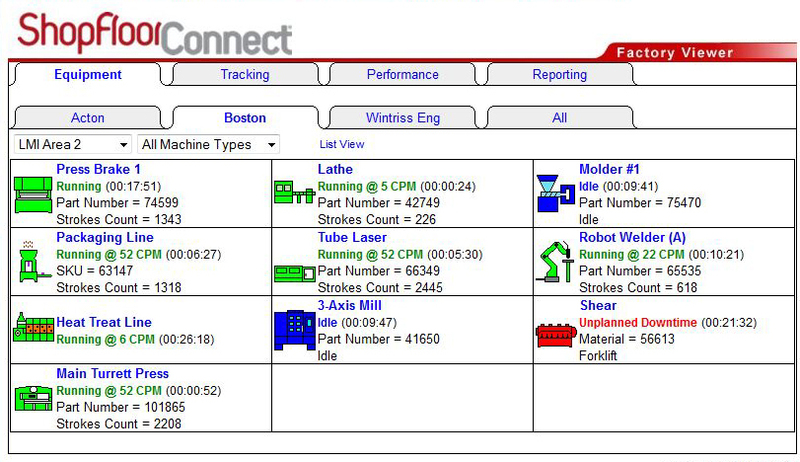 Once a schedule is created, ShopFloorConnect automatically sends the “next job” information to the Machine Interface When it's time to run the next job, the machine operator simply selects “Load Next Job” and the information, including the good parts counter preset, is retrieved from the ShopFloorConnect shop floor management system. The top item in the schedule is then automatically “consumed” and the queue moves up. ShopFloorConnect production tracking software predicts the completion time/date for each job in the queue with an industry-best algorithm that analyzes real-time as well as historical changeover and production data. ShopFloorConnect alerts you whenever job completion is due to occur later than the due date. The scheduling interface of this shop floor data collection system features a simple intuitive interface that allows you to edit job parameters and reposition jobs within the queue. How Does ShopFloorConnect Differ From Other Production Tracking Software? Download our whitepaper to learn more or contact ShopFloorConnect to schedule a demo or for more information. We have a unique skill set: Not only do we provide a robust and scalable OEE reporting product and an on-machine solution that is simple to install and user friendly, but our industrial controls experience gives us the expertise to seamlessly adapt our technology to your machinery.